Home » books » retro review » translation » Retro Review: Jean Paul Sartre's "The Reprieve"
I know I've been a bit quiet on the reviewing front recently. 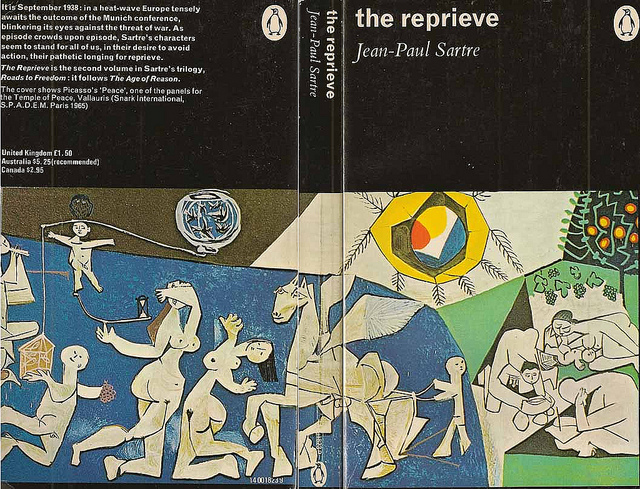 Aside from taking quite a lot of spare time to write, I have also been treading my way through Jean Paul Sartre's The Reprieve, the second in his Roads to Freedom trilogy. Anyway, I have a queue of about four books I'm hoping to read and review over the next few weeks (including some excellent poetry), so bear with me loyal readers. The Reprieve follows the lives of a plethora of different characters in France in 1938, as they await news from the Munich conference. The French army is mobilised, Mathieu is called up, and Sartre boldly recreates a hugely significant moment in modern history. This is not an easy read, with the narrative slipping swiftly and easily between characters in different situations, and a whole host of names to keep track of. However, it is a brilliantly crafted portrait of France on the brink of war. One of the things I enjoy most about reading, is a good writer's ability to create a visceral picture of a historical period, and this is where Sartre succeeds. Unlike the first book in the series, which is driven more by Mathieu's personal conundrums, this is very much a story about how people in 1938- having had the virtues of peace constantly sung to them since WWI- come to terms with the possibility of war. The character's reactions vary greatly, from fear, to moral objections, and even to a sense of freedom. As ever, Sartre's characters are highly self-conscious, and the reader is provided with an intimate insight into their innermost thoughts and feelings. I mention this sense of freedom, because it is particularly interesting to me. Mathieu views the propsect of war as one which releases him from the committments of his daily life. He is freed from the responsibility to think about the future, as he knows death is a real possibility. Yet this discovery does not bring solace. In fact, the realisation that he has achieved freedom is a huge anticlimax. Perfectly pitched, beautifully written, as ever Sartre's novel feels like an epic, despite the action only taking place over a mere eight days. I look forward to reading the final installment of the trilogy when time allows.